Bluetooth Speaker, Mini Wireless Speaker with Colourful LED Light and Build-in Mic Support USB/AUX/TF/SD Card for Cell Phone iPhone iPad Samsung Galaxy Portable Bluetooth Speaker Technical Parameters Speaker Type: Portable Bluetooth speaker Adjustment: the key Features: Bluetooth audio input, Bluetooth hands-free calling, LINE IN, TF card Power supply: DC 5V, lithium battery Effective power: 3W SNR:> 80DB Frequency: 90Hz-20KHz Audio Interface: 3.5MM Transmission range: Up up to 10 meters, the data is measured in the open without shelter area drawn. Walls and buildings may affect signal transmission. Material: ABS product features 1. 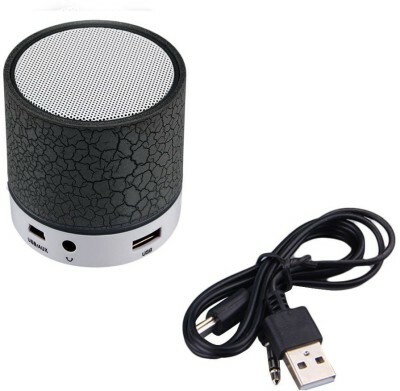 Mini portable wireless bluetooth speaker card music player with stylish appearance, and durable. 2. Built-in high definite mircophone which support hands-free calls. 3. Support TF card autoplay feature. 4. Support audio output can be connected to the computer, cell phone, MP3 and other audio interfaces. 5. The small body flooding, greatly capacity, large volume, treble deep and powerful. 6. Colorful LED light effect gives romantic environment. Packing Include Bluetooth Speaker *1 Mircro USB Charge Cord *1 Important Information :- Don't Use the Mini Bluetooth Speaker while Will Charging ! !